By IOOA chairman, Professor Pat Shannon. Increased greenhouse gas emissions resulting from population growth, rising living standards, industrialisation and modern life, are placing unprecedented pressures on the global climate, and we must transition to a lower carbon future. In planning and implementing the transition, a review of the current energy system, and of past and recent trends in energy consumption, as well as risks and costs of energy interruptions, provides a useful backdrop and highlights the challenges and realities faced at global, European and Irish levels. The world’s population is projected to grow by approximately 24% from the present 7.4 billion to 9.2 billion in 2040 . The latest CSO projections indicate that Ireland’s population will grow by 18-40% by 2051. Reflecting increasing population growth and rising living standards, global energy consumption rose by 2.2% in 2017, and has increased by approximately 65% in the past 25 years)  (Fig. 1). The IEA predicts that this growth will increase by approximately 30% in the period to 2040. BP’s 2018 Statistical Review of World Energy (67th annual review)  shows that fossil fuels (oil, gas, coal) provide 85% of global primary energy, with renewables providing less than 4%. 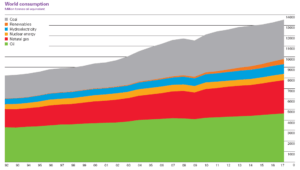 The share of global primary energy consumption by fuel has changed somewhat over the past 40 years: oil falling from a high of 50% in 1971 to 34% in 2017; gas rising from 15% in 1965 to 23% in 2017; and coal initially falling from 37% in 1965 to an average of 28% over the past 45 years. Hydroelectricity has remained generally flat (<7%) over that period, with nuclear energy flattening and falling slightly in the past 30 years (currently ~4.5%). Renewable energy has been rising considerably but still only comprised a 3.6% share of consumption in 2017. This shows that change in energy fuel demand and consumption happens slowly, on a multi-decadal scale, and that the global energy transition from high to lower and non-carbon sources, is likely to be lengthy. Recent forecasts  indicate that by 2040 oil, gas, coal and non-fossil fuels (hydro, nuclear, renewables) will each contribute around 25% of the world’s energy. Even if renewable sources continue to grow globally at exponential rates, they will be insufficient to meet the added energy demands and replace the 85% of energy that is currently provided by fossil fuels in the short or medium term. Oil and especially gas will therefore remain vital energy sources for decades to come, throughout the energy transition. The location of energy resources is unevenly distributed across the globe meaning that many regions of the world are dependent upon energy imports. Sometimes the import distance can be long, adding additional carbon footprint through transport-related emissions. Europe is one such region. Europe imports 75% of its oil and 50% of its gas requirements . 33% of Europe’s gas comes from Russia . The UK, through which Ireland imports almost half our current gas requirements, imports more than 1 million barrels of oil equivalent per day to meet its needs. UK energy import dependency, currently at 36%, is anticipated to reach 55% by 2030. At the opening of the 4th EU Energy Summit in Brussels in April 2018, the EU Commissioner for Climate Action & Energy, Miguel Arias Cañete gave a thought-provoking speech highlighting the major geopolitical challenges that need to be addressed in the transition to a less carbon intensive energy future. He said that secure, competitive and environmentally sustainable supply of energy is fundamental for our modern societies, our industries, our homes and our very way of life. For the EU, an important challenge in an increasingly uncertain world is that we are still heavily dependent on fossil fuels, and this dependence will only decrease gradually. He stressed that coal, gas and oil still accounted for 72% of EU primary consumption in 2016, with most imported, including approximately 88% of oil requirements and 70% of the natural gas used. He stated that future scenarios show that we will be producing less of these fossil fuels in the EU and, while our overall consumption of fossil fuels will be reduced over time, the level of fossil fuel imports required to meet our needs will not decline at the same pace. He said that the main challenge for the EU is the natural gas sector. In 2016, 76% of our extra-EU gas imports came from just two countries, Russia and Norway. A further 13% was in the form of LNG (mostly from Qatar), while the remaining 11% came from Algeria and Libya. The current and recent international geopolitical situation requires the EU to look even more urgently at enhancing its own energy reliance. Cañete suggested the key to this over the medium to longer term is reducing the overall dependence on imported hydrocarbons. 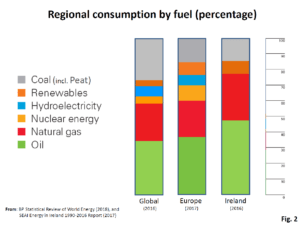 In Ireland, fossil fuels account for 92% of our primary energy requirements . 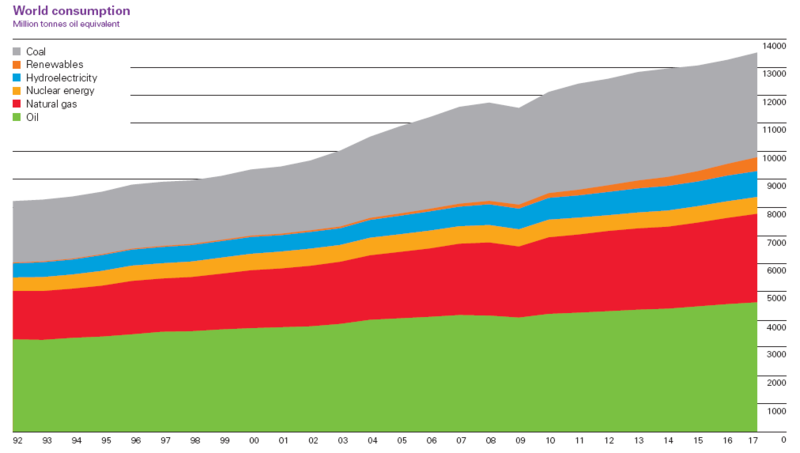 Oil is the main source of primary energy, at 48%, with gas at almost 30%, coal over 9%, peat at 5% and renewables at 8% (Fig. 2). Almost 71% of our energy sources are imported, including all our oil and coal, and currently 45% of our gas need and we must be mindful that our geographical location at the edge of Europe makes Ireland extremely vulnerable to potential interruptions in energy supplies. 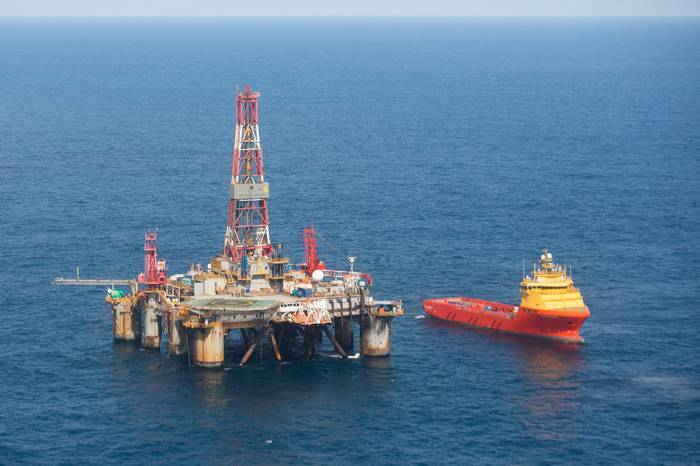 The Corrib field offshore Mayo currently provides just over half of our gas needs. However, production levels have already peaked and will continue to decline naturally. Production is forecast to be less than two-thirds of peak production levels by 2020. Until recently, the Kinsale Head gas field stored some strategic gas supplies (capacity of 230 million cubic metres). This facility will be decommissioned soon. Ireland will then hold no contingency gas reserves, further increasing the exposure to supply interruptions. Ireland currently has no direct link to mainland Europe gas or power networks. This poses a significant risk to our energy security in the event of gas interruptions – likely to be further increased when the UK is no longer a member of the EU. During the cold spell in early 2018 (Storm Emma), the UK, our only external source of natural gas via the gas interconnector, came close to being unable to meet its own gas demands. 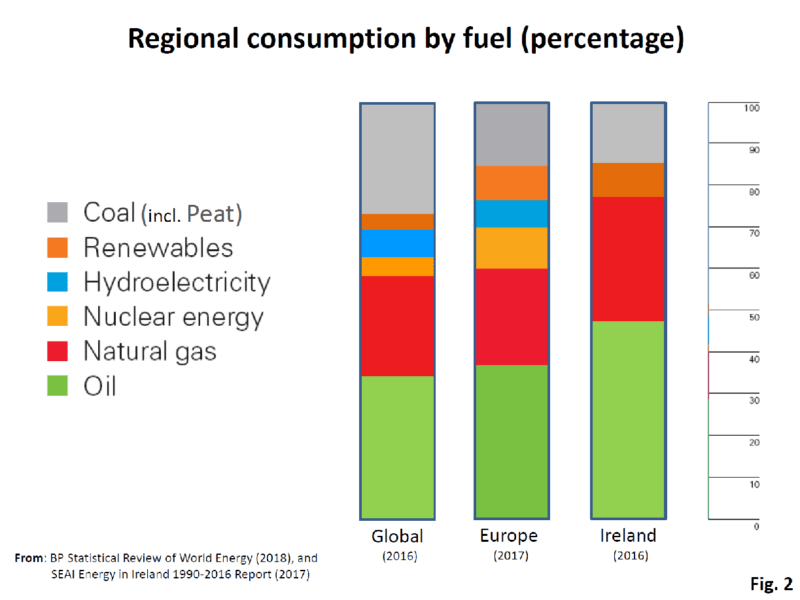 The Economic and Social Research Institute (ESRI) estimated that the cost of losing one day of gas‐fired electricity in Ireland could be in the range €0.1-1 billion, and losing three months of gas‐fired power could cost up to €80 billion or 50% of GDP. Losing natural gas for heating for three months could add another (on average) €8 billion cost to the economy. The effects would be felt in all our homes, schools, hospitals, and throughout industry. The pathways to a low-emissions future require international action on (a) significant policy implementation, (b) technology development and deployment and (c) business response, with all sectors working in harmony rather than in opposition. At a regional level, an EU energy union with a fully connected and integrated energy network is required, with a greater focus on the replacement of imported energy sources by indigenous supplies, including hydrocarbons. For Ireland, a small and relatively isolated energy system, a coherent and realistic strategy is needed that will ensure energy security and affordability while minimising damage to the economy or society. A broad range of energy sources will help lessen risks and build a sustainable future. The transition will involve the increasing growth of renewable forms of energy. However, natural gas and oil will continue to play a key role in terms of security of affordable energy supply and in providing the necessary base load backup for intermittent renewable energy sources such as wind and solar. Oil will continue to be important for aviation, shipping and haulage, as well as for non-burning uses including petrochemicals and other feedstocks. Revenue from Irish offshore gas and oil can provide vital revenue that could be used to help fund the energy transition. The direct tax take to the State from a single commercial oil discovery under the 2014 revised fiscal system is estimated to be in the range of €4 to €8 billion. To put these figures into context, according to the SEAI website it would take €6 billion to retrofit the 150,000 BER G houses in Ireland up to an acceptable modern standard . Therefore, it is vital that we keep open all available energy supply options, especially indigenous oil and gas exploration, a view which is also recommended by the International Energy Agency. Having our own oil and gas would bring benefits in many ways in securing Ireland’s energy independence as well as providing a revenue stream to support the energy transition. The oil and gas industry can play a key role in Ireland’s energy transition. This can be done by exploring for, and developing, in a safe and environmentally-responsible manner, indigenous offshore gas and oil, and by utilising the expertise, innovative ideas and technologies being pioneered by the oil and gas industry. Partnering the oil and gas industry with the developing renewables industry through natural synergies will help realise the transition to a more sustainable energy future. BP Energy Outlook. 2018 Edition. BP Statistical Review of World Energy. June 2018. 67th Edition. IOGP Global Production Report 2018. International Association of Oil & Gas Producers. 33 pp.